Wouldn’t it be great if instead of managing pain and inflammation in damaged joints and ligaments, we could use therapies that actually restore healthy function and reverse degenerative changes in these tissues, in a sense turning back the clock? This is the goal of Regenerative Medicine Therapies. Have you considered surgery or been told that surgery was the only option for your chronic joint pain or injury? Have you done extensive physical therapy with minimal improvement? Wouldn’t it be great if instead of surgery or corticosteroid use, you could manage your pain and heal damaged joints, ligaments, and tendons naturally with your own body’s nutrients? Would you like the option of various therapies that actually restore healthy function and reverse degenerative changes in these tissues—in a sense turning back the clock? Well, thanks to modern medicine and research, we now have this opportunity. This is exactly what Regenerative Medicine does; it provides you an alternative to heal and restore your joint without invasive treatment. Regenerative medicine is a branch of medicine which focuses on the body’s ability to repair and regenerate new tissue. It uses molecular biology mechanisms to stimulate the process of replacing, engineering or regenerating human cells and inducing cellular differentiation. When an affected area has been injected with specific regenerative solutions, cellular signaling begins by inducing differentiation of cells into what they are needed for. For example, in minor osteoarthritis, regenerative medicine techniques have been shown to help form chondrocytes which are the foundational cells for cartilage repair. This process allows the body to establish normal function by providing the cells needed for optimal health. This is the reason regenerative medicine can be used for an array of varying types of pain, injuries, and elective aesthetic procedures. Regenerative medicine therapies are used to treat various aesthetic needs from hair growth to collagen building as well as tissue and joint repair. This is all done by stimulating the underlying mechanisms that are utilized by nature to restore structure and function to damaged or diseased tissues and organs. What is the Primary Goal of Regenerative Medicine? Restorative medicine is a cutting-edge field with the goal of restoring both structure and function to damaged tissues and organs. It works to create effective solutions for joints and tissues that become permanently damaged. The goal of this medicine is to find a way to regenerate previously untreatable injuries and diseases. Prolotherapy uses a relatively simple formula we prepare in the clinic that includes B vitamins and dextrose which induces a regenerative response within diseased or damaged tissues. In our series of treatments, we typically start with Prolo solution only on the first visit. This solution causes stimulation to the area and produces a mild inflammatory response that facilitates a variety of different proteins and peptides to migrate to the area and begin the healing cascade. Furthermore, the Prolo solution continues to cause a process of proliferation of healing cells and chemicals which repair and promote healthy tissue regeneration. After the first treatment we often combine prolotherapy with platelet-rich plasma for improved treatment effects. Platelet rich plasma/PRP plays a large and important role in Regenerative Medicine. PRP uses a volume of fractionated plasma taken from your own blood and used topically or injected near joints and tendons. This yields growth factors as well as initiating stem cell signaling to promote what your own body does naturally to repair and restore healthy tissue function. The growth factors from the isolated plasma is what we’re primarily harvesting and concentrating. Growth factors, in a sense, play the role of messengers, signaling local cells to function. PRP is used in medicine to treat a wide range of health issues, including arthritis, signs of aging, aesthetic medicine, and as an adjunct therapy to numerous regenerative medicine techniques. Regenerative medicine has been used to treat an array of joint related pathologies. PRP/prolo has demonstrated a strong ability to heal tendons, repair ligaments, rebuild cartilage and help with surgical recovery. This treatment has gained significant attention due to its positive outcomes and use from world renowned athletes such as Kobe Bryant and Tiger Woods. This simple 60-minute, in-office technique yields a more desired facial skin surface and skin tone. By using tiny micro needles across your skin’s surface, that layer is gradually sloughed off while new cells are being regenerated for a healthier glow. PRP increases collagen and nutrients such as growth factors which penetrate into the open pores during the treatment. Combining PRP with microneedling can also help reduce and shrink scars of many types—postoperative, injuries, stretch marks from pregnancy, weight gain or weight loss. Men and women with thinning hair are great candidates for hair regeneration with PRP. The growth factors from PRP can help stimulate the activity of the hair follicles and promote new hair growth. For best results, consistency is key. Treatments are typically performed once a month for the first three to four months, and then every three to six months thereafter, depending on the individual patient’s response and results. Following this protocol, anticipated results can be seen within two to three months. If you have questions about any of the Regenerative Medicine therapies offered at SFNM and to see if this may be right for you, Dr. Jillian Shannon, our Regenerative Medicine specialist, offers free, 15-minute consults. 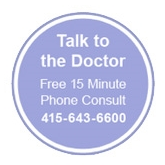 Schedule your free consult online or for more options, give us a call at 415-643-6600. We look forward to seeing you and being a part of your healing journey! Do you struggle with stubborn fat? Particularly in the stomach, inner thighs, neck, buttocks, hips and underarms? If so, you may benefit from receiving an MIC injection. MIC is a blend of powerful “lipotropic” compounds that metabolize fat deposits and speed up the removal of fat. When administered in combination with a proper diet and regular exercise, this lipotropic formula can assist your body in eliminating fat, while simultaneously increasing your energy levels. Additionally, MIC can aid in detoxification, sleep, hair growth and supporting the nervous system. Let’s see how MIC injections works!